In 1973, Maurice ROBERT and his wife Simone invested and bought Château Turcaud. Originally both from Charente Maritime, they grew up in a wine area between Saintes and Cognac. As a teenager, Maurice spent much of his time with his cousins, wine growers near Cognac. He caught the virus of the vines, through his relatives who explained at length all the secrets of the trade. A Few years later he became the head of a farm for 6 years at Bégoin, as a producer of Pineau and Cognac at Jonzac. Then he managed the Chateau of Cadillac in Fronsadais for West-Indian investors. In 1970, he finally worked for a major wine professional, André Lurton, until 1978 where he acquired precious experience as a wine grower. Wine quickly becomes his life passion. In 2009, it is to their daughter Isabelle and to their son-in-law Stephan, that Maurice and Simone ROBERT transmitted the fruit of their experience and passion. Stéphane has been working at Turcaud since 1994. He is a wine lover and loves all kind of quality wines, whether « small » or great, he loves their diversity and complexity, coming from all wine areas. He wants to take example on what is best. In 2002 Isabelle joined him at her family’s property and trade. Both are really eager to follow up what has been started and developed by their parents since 1973. In 1973, Château Turcaud only counted 7ha50. Gradually, Maurice and Simone ROBERT bought more land as opportunities presented themselves. Today the ROBERT’s Vineyard counts 50 ha with 26 ha of white vines and 24 ha of red vines. Just as demanding as their father and father in law, Isabelle and Stéphane Le May are eager to safeguard/protect the local soil and terroir they have inherited: they are gradually replanting the vineyard with greater density, they’ve come back to mechanically weeding, and fight vine diseases with sustainable methods. 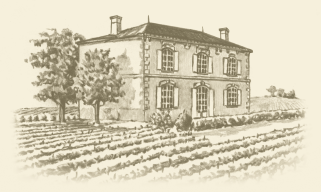 Thus, for two generations now, the team at the Robert’s Vineyards observes, adapts and develops the best techniques of wine making and vine growing which account for all the quality and the specificity of Château Turcaud wine. This is why the production of Chateau Turcaud enjoys an excellent notoriety both for its white and red wines. They are regularly referred to in professional magazines and rewarded in the Open Competition of Paris as well as of Aquitaine. This is the result of the harmonious mixture of passion, experience and family investment.